Guava: a sweet exotic fruit native to Mexico, Central and South America. One guava fruit contains three times the daily vitamin C requirement, potassium, fiber, vitamin A, and lycopene. Whether whole fruit, juice, or jelly, guava is deliciously nutritious. And that’s just the fruit of the tree. Hair – The vitamin B complex (thiamine, riboflavin, niacin, folate, pantothenic acid, and pyridoxine) in guava leaves can prevent hair loss and promote its growth. As a hair and scalp treatment, follow the recipe below. Boil a handful of guava leaves in a quart of water for 20 minutes, then remove from heat and allow to cool to room temperature. Massage the guava leaf tea into your scalp and apply to hair, starting at the roots and working through to the ends. Leave on for 2 hours (or more), then rinse. Diabetes and weight loss – Guava leaves regulate blood sugar, preventing diabetes.By virtue of their high fiber content and inhibiting the conversion of complex carbohydrates into sugar, the leaves drunk in a tea can make you feel full and support weight loss. Moderates cholesterol – In a 2013 study published in the Asian Journal of Pharmaceutical and Clinical Research, guava lea8uf extract was shown to effectively reduce triglycerides (fat) and low-density lipoproteins (LDL cholesterol) and increase high-density lipoproteins (“good” cholesterol). 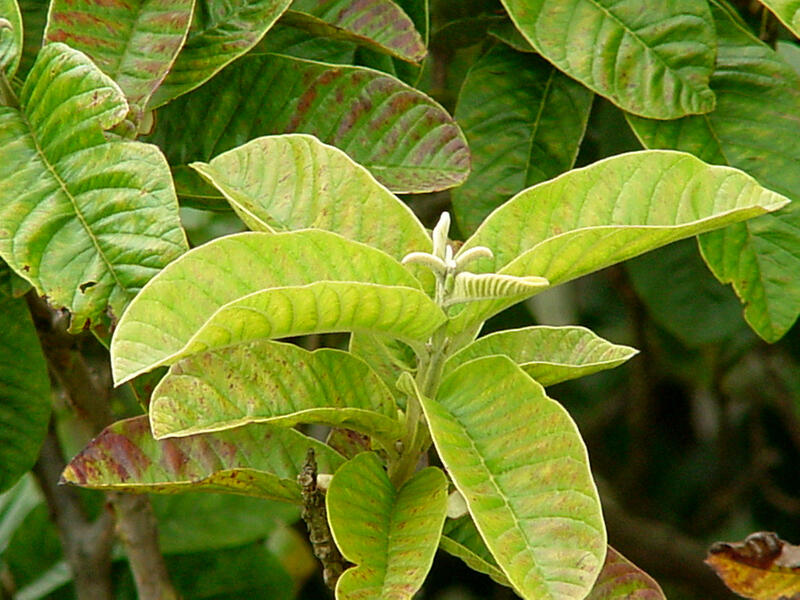 Digestive health – Guava leaf extract causes apoptosis (cell death) in stomach cancer cells. Generally promoting digestive health, guava leaf tea is effective on treating diarrhea, food poisoning, and upset stomach. Male fertility – A Nigerian study found guava leaf extract to increase male fertility in rats without toxic side effects and with implications for humans. Allergies – Guava contains quercetin, the flavonoid antioxidant yellow/orange pigment that is a potent antihistamine, reducing allergic response. This same antihistamine action makes it effective in relieving the sting and itch of insect bites.